Take and serve 3 gallons of beer anywhere! Mini CO2 regulator and CO2 bulb are perfect for portability! Take and serve 3 gallons of beer with you wherever you go! This handy 3 gallon portable beer setup is perfect for taking and serving 3 gallons of beer, and comes with everything you need! This setup is a brand new 3 gallon ball lock keg, a mini CO2 regulator and ball lock gas disconnect, 74 gram CO2 bulb, and a ball lock standard faucet assembly that fits right on the keg! 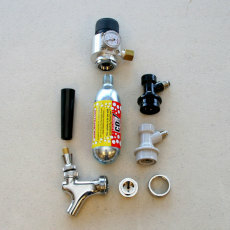 The mini CO2 regulator and CO2 bulb allow you to keep pressure on the beer, keeping the beer carbonated and flowing! The standard faucet assembly consists of a standard beer faucet, faucet adapter, coupling nut and ball lock liquid disconnect. This attaches directly to the keg for serving beer. 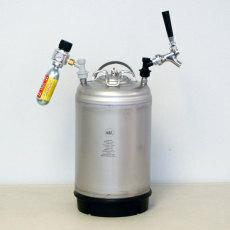 With this setup, you can keg part of your 5 gallon batch of beer for drinking now and bottle the rest for later! Be the hit of every party with this 3 gallon portable beer kegging setup! Have 3 gallons of beer on tap wherever you go! 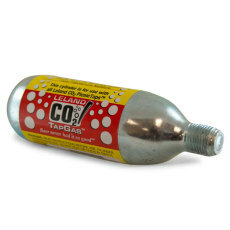 Mini CO2 regulator and CO2 bulb allow you to keep beer carbonated and flowing! Standard faucet assembly attaches directly to the keg for the perfect pour every time!